Present state: Up platform (eastbound) still present and easily viewable from a public footpath which crosses the line at the east end of the platform. Notes: The station was situated on the Garston and Warrington railway which was opened by the St Helens Canal & Railway Company (SHC&RC) on 1 February 1853. 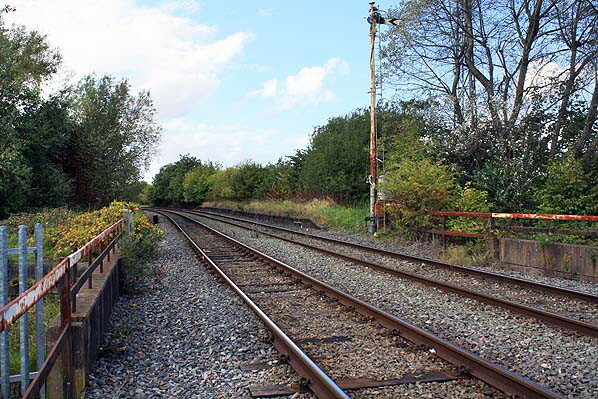 This created a route from Garston to Warrington where, by 1854, an onward connection to the Warrington and Stockport Railway at Arpley allowed trains to travel all the way to Manchester; this created an alternative to the London & North Western Railway’s (LNWR) Liverpool to Manchester route (originally opened in 1830 by the Liverpool & Manchester Railway). Sankey Bridges station was located on the west side of the Sankey Canal over which the line passed on a swing bridge. The canal was the first in Great Britain in the industrial age having opened in 1757 – the Exeter Canal having opened as early as the 1560s - and it originally entered the River Mersey at Sankey Bridges, but was later extended first to Fiddlers Ferry and then to Runcorn Gap. Since 21 July 1845 the SHC&RC had owned the canal following a merger between its predecessor (the St Helens & Runcorn Gap Railway) and the Sankey Canal Navigation Company. The station opened as Sankey Bridges at the same time as the line on 1 February 1853. The line being a double track the station was provided with two platforms. It had only basic facilities, its main building being on the up (Manchester-bound) platform. between Warrington and Garston and between St Helens and Warrington: half of the westbound trains went to Garston and half to St Helens. The SHC&RC had enjoyed a good relationship with the LNWR, and traffic had moved seamlessly between the two systems since 1833 (between the SH&RGR and the L&M). In the 1850s other companies such as the Great Northern Railway (GNR) and the Manchester, Sheffield & Lincolnshire Railway (MS&LR) looked to form alliances with the SHC&RC and the W&S so that they could reach Liverpool. By 1858 the GNR was running a passenger service between Garston and London Kings Cross; it is unlikely that it would have stopped at Sankey Bridges. During that year a locomotive that had worked the London train to Garston was running back towards Warrington, light engine, when the swing bridge had been left open for canal traffic. The locomotive plunged into the canal. There were no fatalities, and the locomotive was rescued a few days later and put back to work. 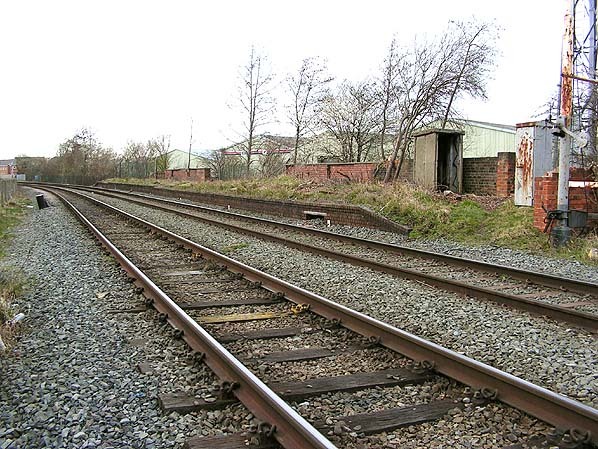 With proposals going forward that would create a route from Garston into Liverpool and to the east to connect the W&S directly to the MS&LR line at Godley, the LNWR began actively to block such moves, which would have a negative impact on the finances of both the SHC&RC and the W&S. Negotiations between the SHC&RC and the LNWR resulted in the larger company leasing the line from 1 September 1860. The LNWR took over the W&S on 1 January 1861 (having leased it in partnership with the SHC&RC from 13 August 1859) and it was only a matter of time before the SHC&RC would succumb. Not satisfied with the leasing arrangement the LNWR took over the SHC&RC on the 1 September 1864. From that point forward the line was destined to be a secondary route as far as passenger services were concerned. The LNWR concentrated its goods services onto the line. By the time the line was absorbed, a new route between Speke and Edge Hill allowed trains to run westwards to the LNWR main line station at Liverpool Lime Street. Local services in the LNWR era tended to run between Liverpool Lime Street and Warrington Arpley, or onwards to Manchester London Road. In 1874 a signal box was also provided at the east end of the adjacent to the swing bridge which it controlled. The box was replaced in September 1893 with an LNWR type 4 wooden top model on a brick base, equipped with a 20-lever frame. The new box was located between the east end of the down platform and the canal swing bridge. By December 1895 Sankey Bridges was served by nine up and nine down weekday passenger trains as shown in the table below. There were three trains in each direction on Sundays. By July 1922 Sankey Bridges was being served by ten up and nine down trains. In 1923 the line became part of the London Midland & Scottish Railway (LMS) but little changed in the day to day operations. In summer 1932 the station had thirteen up and fourteen down trains on weekdays. The station became part of the nationalised British Railways (London Midland Region) on the 1 January 1948. The summer timetable for that year showed the station as having only five trains in each direction Monday-to-Friday with an extra train each way on Saturdays as shown in the table below. With such a poor service British Railways did not keep Sankey Bridges open to passengers for very long, closing it on the 2 January 1950, however passenger services continued to pass through the station until 1 September 1962. In 1959 regular traffic on the canal ceased, and it formally closed in 1963. On 28 March 1964 Sankey Bridges signal box closed and the swing bridge was fixed into position. It was replaced with a fixed structure in the 1970s. 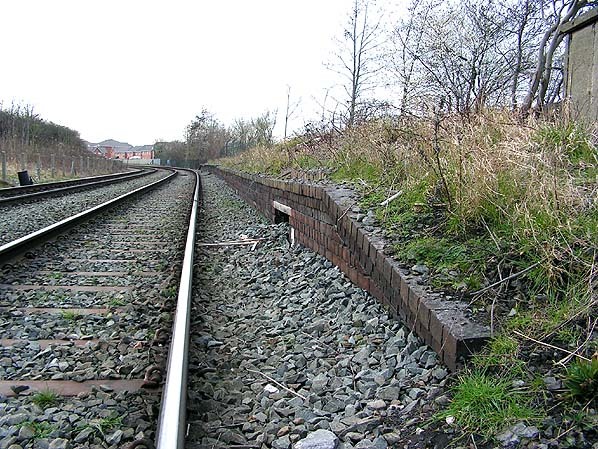 The station’s platforms survived until the 1970s but by 1980 the ‘down’ platform had been demolished. The former up platform was extant in July 2012. 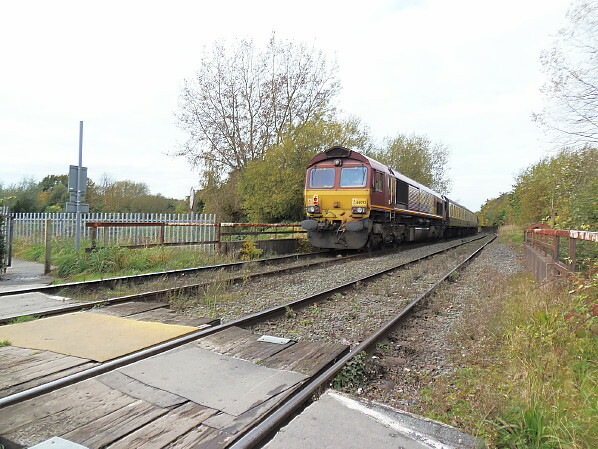 In 2012 the line through the station site was still a busy freight route from Ditton to Warrington Arpley, with heavy traffic running to and from Fiddlers Ferry power station which went into full production in 1971. Sankey Bridges station shown on a 1907 map. 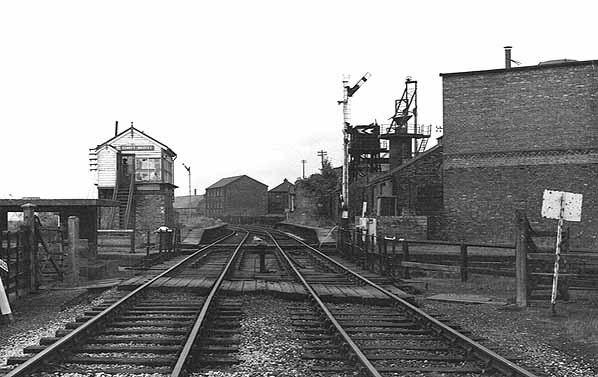 Sankey Bridges station looking west from the swing bridge on 22 May 1971. A light engine class 25 is seen passing through the station in a westbound direction. Both platforms survived at this time. 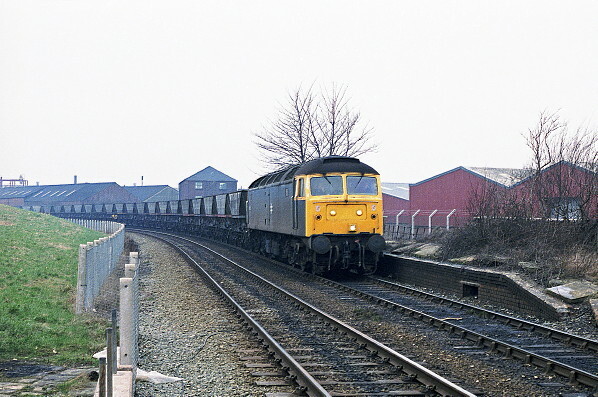 Sankey Bridges station looking west on Friday 24 February 1984 as 47 333 heads east towards Warrington after a visit to Fiddlers Ferry power station. 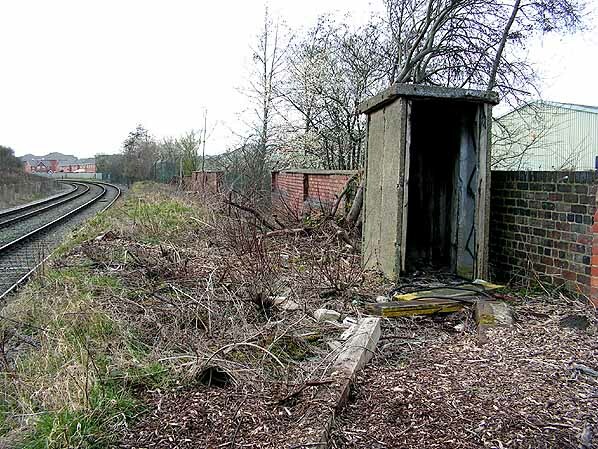 The surviving up platform at Sankey Bridges station seen on 13 March 2005. Sankey Bridges station looking west on 13 March 2005. Looking west along the up platform at Sankey Bridges station on 13 March 2005. Sankey Bridges station looking west in the summer of 2010. Looking west at the site of Sankey Bridges station on 20 October 2012. 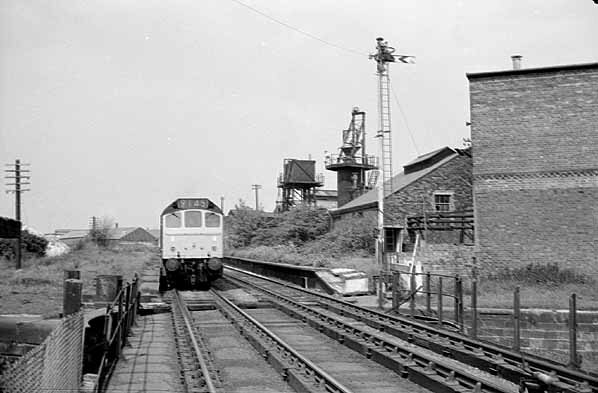 Passing through the station on route to Fiddlers Ferry Power Station was the 'Ferry go Round' rail tour. The tour passed through Sankey Bridges station three times on that day. Its first pass was on route to Latchford from Ditton Junction. It then passed back through on its way to Fiddlers Ferry as seen in this picture. Its final pass was when it left Fiddlers Ferry and ran back to Latchford.